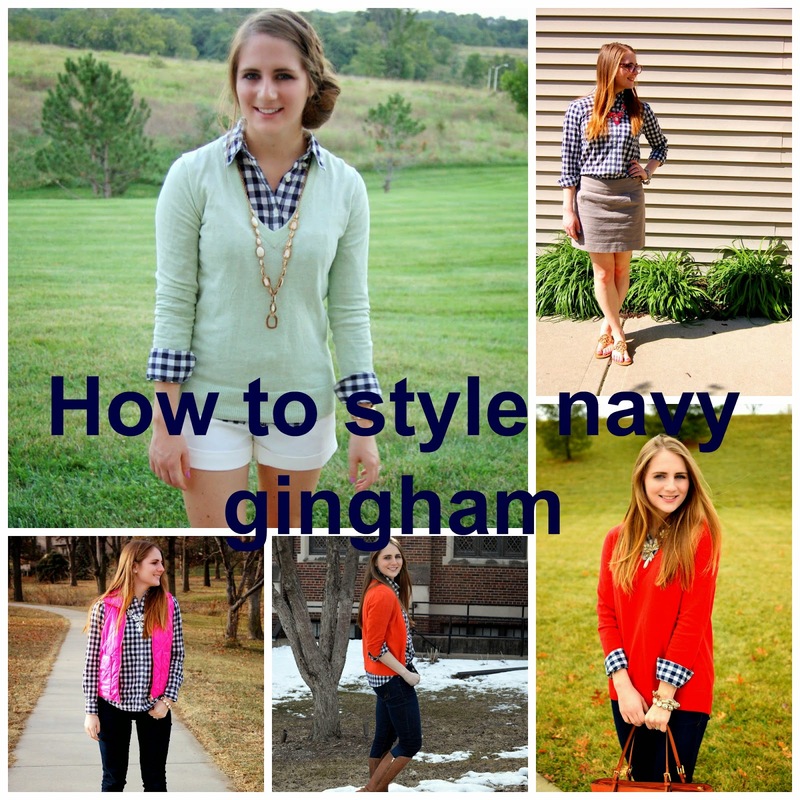 If there is one top that I think everyone needs in their wardrobe, it is a navy gingham top. This time I wore it with a bright orange and left it half-tucked for a casual look. I love the pop of turquoise from my Kendra Scott earrings... I feel like it is an unexpected color combo but they just compliment the outfit perfectly! Back to this navy top. Mine is from Gap and I swear it goes with everything! Want some evidence? Check out the collage below. I don't think there is a season or color it can't be worn with! I have always loved a good black and white outfit, so it is no surprise that this outfit here is one of my favorites! I absolutely low how the white dress contrasts against the leather jacket. (P.s. if you don't have one yet, it is currently 40% off) This look is something that could be fancy if it were paired with heels, but the wedge booties and floppy hat help to keep it casual! Unfortunately both my exact shoes and hat are sold out, but I have linked similar ones above for you. Also, you all know by now that I love Rocksbox. I am on my third month of using the service, and I am hooked! I really wanted some more vibrant pieces, and they definitely listened to my request for this box. If you have not signed up for Rocksbox yet, I have a fabulous promo for you! Sign up with code "darcyxoxo" and get your first month free! Can't beat that for a way to try out a new service! I have always been interested in fashion. I vividly remember taking shopping trips with my mom and sister growing up, browsing magazines for outfits, reading blogs before I knew what they were (in high school I used to visit a Get the Selena Gomez look website every day for ideas! ), and eventually worked retail. Makeup, however, was not something I totally loved growing up. When I discovered the YouTube Community last Summer, I was instantly hooked. I love learning more about how to apply makeup. I still have a lot to learn, but lately I have been very into creating new makeup looks! 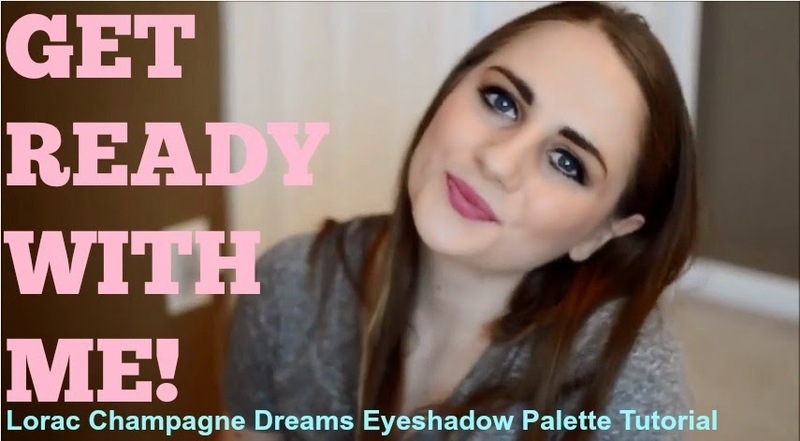 Last week, I uploaded a new Get Ready With Me video using the Lorac Champagne Dreams Eyeshadow Palette. This palette was a Christmas gift and I LOVE it. It was only available for a limited time, but if you like it you can find it on eBay! I would love if you would check out the video, give it a thumbs up, and subscribe for me! Check out the video here or you can watch it below! Happy Monday! I hope you all had a great weekend! I had my first bridal shower this weekend and it was so fun! We also had a couple final meetings with some wedding vendors to finalize details for the big day... like flowers, catering, and designing our programs! On the weekends, I generally like to keep it casual. A boyfriend cardigan, a simple v-neck, and some fun jewelry make for the perfect look to run errands in! These turquoise pieces from Kendra Scott have been on heavy rotation lately. They provide the perfect pop of color to this otherwise neutral look! Happy Friday! I am particularly excited for this weekend because I get to have my first bridal shower! Tyler's Aunt is hosting it and I am so excited. The next few weeks are going to be very fun-filled with lots of wedding festivities and I cannot wait! I wore this outfit this past Sunday. It was freezing here in Kansas City so I needed a comfy sweater! Last time I featured this sweater, the look was more dressy. This time, I wanted to keep things comfy and casual. This cardigan is still in stock and is under $30! Shop it here. I recently got this one from Nordstrom and love the flirty bottom detail! Side note about this skirt, it arrived in the most fancy packaging ever. It came individually wrapped and still on the hanger! Not sure if this is something new, but I definitely felt like I order a $1,000 skirt with that packaging haha! If you follow me on Instagram, then you saw I received this Kendra Scott necklace recently! I am obsessed with the turquoise color of the stones. The first color I wanted to pair it with was pink, and so I instantly planned an outfit around my pink puffer vest! Pretty much all of the pieces in this outfit are old, but I linked similar ones above! Happy Friday! Who's ready for the weekend?! Tyler and I are going on our Valentine's Date tonight. I am not really a huge fan of the holiday, but I will take the excuse to get dressed up and go out to a nice dinner! Still trying to decide what to wear? Check out these three different posts, each styled around a different piece; classic red dress, whimsical heart print blouse, or the look with just a pop of red. How pretty is this necklace?! It came from The Shopping Bag. If you visit their site once, you will be hooked! They have the cutest accessories, clothes, and even home decor! I am particularly loving this romper. If you check out their site and love it, make sure you use the code "AMEMORYOFUS" for 25% off! Also, are you following along on Instagram? I am currently running a giveaway with some other bloggers and you can win $400! Check it out :). When I picked up this top from J.Crew Factory recently, I instantly knew I wanted to wear it with an all black outfit. I have been loving the all black outfits with just one different colored piece that are all over Pinterest and Intsagram right now, so I was excited to recreate it myself! If you have not checked out the inventory at the Factory recently, do yourself a favor and head on over! They have their Spring and Summer stuff out and I would love to add these printed shorts or this cover up to my wardrobe!